Millions of Roma across Europe experience prejudice, exclusion, forced evictions, segregation in schools, lack of access to essential services and hatred that can lead to violence. How do they deal with discrimination on a daily basis and still keep going? What motivates them to hope that the future is going to be better? Here are four Romani activists talking about their fight for their human rights, the rights of their children and their communities. Peter and Marcela won their fight against their children being segregated in Roma-only school classes. Peter and Marcela live in Levoča, Slovakia. With support from Amnesty, they recently won a fight against their children being segregated in Roma-only school classes, although this practice still carries on. Claudia Greta and others from her community are campaigning for adequate housing in the city following their forced eviction in 2010. Claudia Greta and her community were forcibly evicted from Cluj-Napoca, Romania, in December 2010 and resettled on the city outskirts, next to the municipal rubbish tip. Their story was featured in our 2012 Write for Rights letter-writing event. Claudia and other activists are now campaigning with Amnesty International to be moved back into the city and into adequate housing. “The eviction day marked me for the rest of my life. Since then we have fought to show people that we should enjoy the same legal rights as everyone else. I want to show the whole world that we will not give up, even if we have a darker skin colour. It doesn’t matter – we are all human. I don’t want our children to spend their childhood in hell. “I want people to see that we are normal people: we send our children to school, we go to work, our children go to kindergarten. We do normal things like any other ethnic group. We are human beings. “Going to Warsaw with Amnesty International had a big impact on me. A 10-year-old boy showed me the letter he wrote for us. It touched me deeply. Now we feel that we are not alone. Each letter shows that others are fighting beside us. When I see so many encouraging letters, I can’t give up. Even dying won’t stop me. I will leave someone in my place to continue. “When Romania joined the European Union, that included Roma and Hungarians, Jews and all other ethnic groups living here. So even we are part of the European Union. If the EU sees discrimination in our country, then it should take action. Rita Izsák is a Romani woman from Hungary. She is now the UN Independent Expert on Minority Issues. “My mother’s surname is Orsós, a traditional Roma name. Throughout my life, when I’ve had to give my mother’s name for official documents, it was always clear that I belong to the Roma group. “When I was a student working part-time as an event organizer, I was suddenly fired for no reason. I heard my boss had found out that my mother was Roma, and he couldn’t have the company represented by a Roma woman. It didn’t matter that I was at law school, that I spoke two languages fluently, was clean and polite; the only thing that mattered was that my mother was of Roma origin. 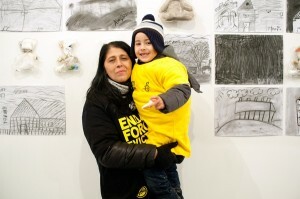 “I got angry, and joined the European Roma Rights Centre. I became a Roma rights activist. I was faced with this terrible truth, and it made me a fighter. “I can see good signs – for example, my organization in Hungary just established a Roma women’s club, where I see dozens of very promising, highly educated, young, talented Roma women working for their communities. “I think what’s missing really is clear language about what’s going on. There are not enough frank discussions, allowing people to digest what’s happening. Politicians are often too scared to use words such as “segregation” or “violence” or “killings of Roma”. There is silence. “Hate speech and hatred is rising, not only against Roma but also other groups, such as Jews and Muslims, in Western Europe. But Roma stand out because we are targets in almost all the countries where we live. The big difficulty is that we lack political, economic or media power. So it’s important to find platforms to show solidarity. There is always a way to reach out to these communities.